QUOTES — N2U a digital art group N2U is a digital art group And like the chemical formula its named after, N2U is all about experimentin, using digital art, light art, interactive art, video art ,art installation to reveal the surrealism of life through visual arts. What the art world says ? Le Eye’s Walk Digital festival développe des projets artistiques dans l’espace public de plusieurs villes de Grèce, sous l’égide du Ministère Hellénique de la Culture et des Sports. Le festival provoque la rencontre entre l’héritage culturel, l’architecture, l’espace public et la communauté d’un lieu précis avec une des formes la plus moderne de l art contemporain : l’installation video, la réalité mixte [VR/AV] et la performance -in situ –. L’art numérique de N2U capte toujours mon attention et m’éblouit par son mélange de poésie, son expérimentation rigoureuse des technologies digitales et son capacité d’interaction avec le public. N2U développe les trois éléments capitaux de l’art contemporain : Ils sont innovants, ouverts à des nouvelles collaborations et ouverts à des nouvelles cultures. Pour toutes ces raisons, je travaille avec N2U sur la concrétisation de leur oeuvre « CHAPITRE » en Grèce avec l’équipe de Eye’s Walk Digital festival. Je suis ravie de voir peu à peu leur œuvre s’exporter et côtoyer des forces artistiques nouvelles ainsi que le public international, ce qui au vu de leur savoir-faire et de leur passion pour l’art contemporain et numérique ne m’étonne pas. It is a pleasure and honor to strongly recommend Eric Szerman for this residency program with his project CHAPTER / CHAPITRE. When he wrote to tell me about his group’s latest project with literature in public libraries, asking the public to read an excerpt of their favorite book and interview them about what they like about reading, I immediately was deeply interested. I became even more deeply interested when I read more about their plan to film this library public to capture their emotion and then create a three-screen, multi-channel art video downloaded in an interactive digital art installation called CHAPTER. In my 27 years of collaborating with students, readers, artists in university, art and general public spaces throughout the Americas and, recently in Europe and Asia, I have worked with hundreds of people and projects. So, I have deep experience with the kind of dedication, expertise with public and art and the technical logistics and being able to read the moment in terms of what will resonate with the public in front of you (in this case the library readers) and then what will resonate on film later when circulated globally online. I believe this project CHAPTER has this potential to resonate in both the immediate local moment as well as the later filmed online version for multiple audiences. As a university professor and as an artist, I see this project’s focus on reading and art as fundamentally important. In our world of increasing competition for our time and attention via technology and the barrage of daily information coming at us, I believe CHAPTER is the kind of project with reading and reading to each other that we need in our world. To capture that reading and engagement with it and with each other on film and circulate that process and the emotions experienced could have a meaningful impact on youth and people of all ages. I first met Eric and the N2U collective last year when they were doing a project as part of Nuit Blanche in Paris. They were working in an elementary school and inviting children and people of all ages to learn —through an interactive shadow and light projection that they could literally place their hands in—about how imagination works. One of the goals of this collaboration, as I understand it, was to also inspire people to realize they can have an impact in their own world. When I walked into this elementary school classroom, it was buzzing with energy and full of people of all ages. It was clear that the public was deeply engaged with the project. Eric immediately greeted us and we had an immediate conversation about the work and why they were doing it. We followed that conversation up a few weeks later when I returned to Paris and we talked more deeply about our respective work and reasons for doing it. I have not stopped thinking about the resonances between our work. Nous avons eu le plaisir de vous accueillir pour cette édition SAFRA’NUMERIQUES du 19 au 23 mars 2019. Je tiens à vous remercier pour votre belle présence, votre engagement soutenu et infaillible.Vous avez su transmettre votre perception pertinente aux milliers de jeunes qui venaient découvrir notre événement dédié aux arts numériques et nouvelles technologies. Votre œuvre intitulée « Ne pas regarder le soleil dans les yeux » a particulièrement été remarquée et vous avez permis à un très grand nombre une approche sensible et déterminante. Le sujet climatique nécessite un réveil des consciences. Vous avez su l’appréhender de manière éclairée dans sa version artistique. Merci pour votre participation quotidienne votre engagement inlassable et étonnant, ce fut sincèrement une très belle surprise, une très belle démarche qui ne transparaît pas systématiquement dans les choix que nous avons à faire. Je vous transmets toute mon amitié, mon soutien, en vous souhaitant une excellente continuité avec cette œuvre sensible pédagogique dont nous avons tous besoin. 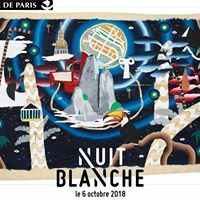 A night time Contemporary art exhibition in the city of Paris, Nuit Blanche attracts more then one million visitors every year and showcases all forms of contemporary art creation to cater all type of audiences. On this occasion, the digital art duo N2U has demonstrated their capacity to federate all those audiences by exhibiting a work of art combining simultaneously interactivity and poetry with their installation CHIROMANCY during the NUIT BLANCHE 2018. At the heart of the historical quarter Le marais, within the walls of the Neuve Saint Pierre School, the visitors were invited to discover fragmented alternative futures, in a a reverse shadow play where shadow gave way to light. Thanks to hands movement, dreamlike evocations were nourishing a narrative storyline. And as far as the logistic aspect of the project, complicated at time, the collective has demonstrated their rigour, their skillfulness and their ability to federate. they create something totally new. Front Page of the official guide to Jerusalem "I travel Jerusalem"
— Ynin Shillo, curator of the AVI festival in Jerusalem.